We organize a free public forum, generally monthly. Join us to listen and discuss current issues with our knowledgeable speakers. See our next event here. We would like to thank Vicki Solomon-McClain for the videos. Check Vicki's Youtube channel for more interesting content. for Cheese, Crackers and Conversation. Wikipedia on the "Great Dictator"
Chaplin's film advanced a stirring, controversial condemnation of Adolf Hitler, Benito Mussolini, fascism, antisemitism, and the Nazis. At the time of its first release, the United States was still formally at peace with Nazi Germany. “The dangers imposed by the greed of big oil on the people who live along the Missouri river is astounding." The event is free but folks are encouraged to bring donations for the Stone Camp. Come learn more as the issue as the Wisconsin United to Amend resolution opposing Citizens United will be on the ballot in Rock County in November. 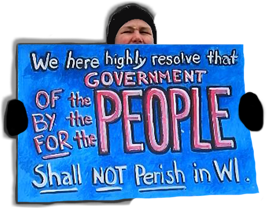 Wisconsin United To Amend (WIUTA) is a non-partisan state network of concerned citizens dedicated to restoring our representative democracy, by minimizing the corruptive influence that money has on our political process. We seek to overturn Citizens United and related Supreme Court decisions so we may reclaim the liberties and privileges guaranteed in the U.S. Constitution for real people. Blue Jean Nation is working to promote the transformation of democratic institutions that are failing America and reinvigorate our republic through community outreach, civic education and engagement, grassroots organizing, public policy advocacy and social action. Blue Jean Nation founder and president Mike McCabe is the author of Blue Jeans in High Places: The Coming Makeover of American Politics and for 15 years was the executive director of the Wisconsin Democracy Campaign, a nonpartisan watchdog group that specializes in tracking the money in state elections and works for reforms aimed at making people matter more than money in politics. During his time with the Democracy Campaign, Mike was a leading government whistle blower and earned a reputation as one of the nations best political money trackers. Under his leadership, the Wisconsin Democracy Campaign was named the Citizen Openness Advocate of the Year in 2012 by the Wisconsin Freedom of Information Council and the state chapter of the Society of Professional Journalists. In 2013, Community Shares of Wisconsin honored Mike with its Community Leadership Award, and in 2015 the Wisconsin Farmers Union gave him its Friend of the Family Farmer award. Mike is a Wisconsin native and was raised on his familys dairy farm. He is a 1982 graduate of the University of Wisconsin-Madison School of Journalism. Which Government Should Control Which Issue? This time we are doing something a little different, asking each of these Janesville City Council members to address the question of which issues should be addressed at the city and county level as opposed to the state? When is control at the state instead the local level a problem? Janesville city council Vice President. First elected in 2016. Term expires in 2018. First elected in 2015. Term expires in 2017. Afternoon Talk Host at Big Radio Group. Drive Home with Sly show from 3pm-6:30pm weekdays on 93.7FM, Big Oldies WEKZ. One of our best public pogressives. Listen to the station online. This position is currently held by Rep. Andy Jorgensen, D-Milton. The 43rd District is at the intersection of Dane, Rock and Jefferson counties southwest of Madison. The major communities are the college city of Whitewater,and the small cities of Milton and Edgerton. Otherwise its a very agrarian district. Anissa Welch is Mayor of Milton. She served for two terms as a Milton alder. Is a former President of AFSCME Local 2489, and was a social worker. Don is a retired social studies teacher and coach at Milton High School. He served for four years on the Milton City Council. He currently serves on the Milton School Board. Sierra Club, Conservation Programs Coordinator of the John Muir Chapter. Tressie earned a degree in wildlife ecology from the University of Wisconsin-Madison and a law degree from Cardozo Law School in New York City. She enjoyed working for state and federal environmental agencies and non-profits during her time in New York, and she also spent a summer in Wisconsin as a Midwest Environmental Advocates Law Clerk. After practicing law out east, Tressie returned to Wisconsin to be closer to family, the UW Arboretum, and the shores of Lake Monona. She most recently worked as a policy analyst for the state, focusing on alternative transportation and air quality programming. We protect water quality and quantity by reviewing and commenting on state waste water permits; advocating for state regulations on how manure is applied to farm fields; advocating for state protections regarding groundwater pumping; and supporting local groups demanding that public water stay out of private hands. What does the Bernie revolution mean for the progressive movement? One Wisconsin Now article on the Walker money being used in this election. NEW NEWS: Change of Plans? State High Court Candidate Rebecca Bradley Coordinates With Right Wing Group to Boost Her Campaign. Salih D. R. Erschen is the Amir (Director) of the Janesville Muslim Dawa Circle. He is currently employed as the Chief of an EMS department. Originally Salih is from Southwest Wisconsin born into a Catholic household and took on Islam in his early youth being a practicing Muslim for 21 years now. In that time he helped establish the East Madison Masjid, hosted a community access TV program for 10 years and has delivered numerous talks related to Islam at schools, police departments,religious organizations, and more. Salih's motto is that if people understand Islam more they will feel much less fear about it, so he strives to reach out as a type of cultural liaison to helping to bridge the gaps of misunderstanding. Ibrahim Jitmoud is the Imam of the Janesville Muslim Dawa Circle. He currently works locally with Granger. Ibrahim was raised in a Muslim household where his father was a principle and mother a teacher at several Islamic schools in America. This allowed him to receive a private Islamic School education in his formative years. While in college he was the President of the MSA and often lead the prayers. As a young adult Ibrahim decided to pursue a life dedicated to learning the Quran. He traveled to Morocco and Spain in this journey and along the way discovered a spiritual connection to the traditional methods of learning Islam and Quran. He returned to the United Sates when his mother had fallen severely ill and soon after he married which brought him to Janesville. Now he strives to teach Quran to some of the children in the Janesville area and is dedicated to developing the activities of Janesville's first Masjid. "I am not an advocate for frequent changes in laws and constitutions, but laws and institutions must go hand in hand with the progress of the human mind. As that becomes more developed, more enlightened, more discoveries are made, new truths discovered and manners and opinions change, with the change of circumstances, institutions must advance also to keep pace with the times. We might as well require a man to wear still the coat which fitted him when a boy, as civilized society to remain even under the regiment of their barbarous ancestors." This mural is located in Beloit, near 500 Pleasent St., on the side of the old Ironworks building facing the Rock River. 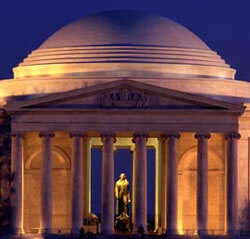 It is a great tribute to the laborers of the 20th century.